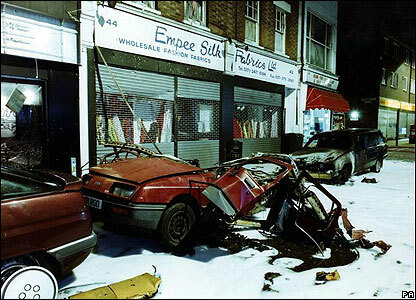 On the 24th April the second of three nail bombs planted by David Copeland exploded on Brick Lane. We have set up this archive to record what has happened since. 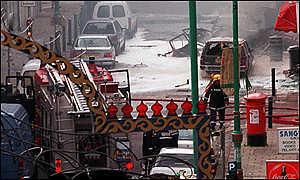 On Sunday 24th April the 17th anniversary of the Brick Lane nail bomb took place outside the site of the Sweet and Spicy Restaurant. The restaurant has changed hands and now serves spicy chicken dishes – we had a nice chat with the wife of the new owner. 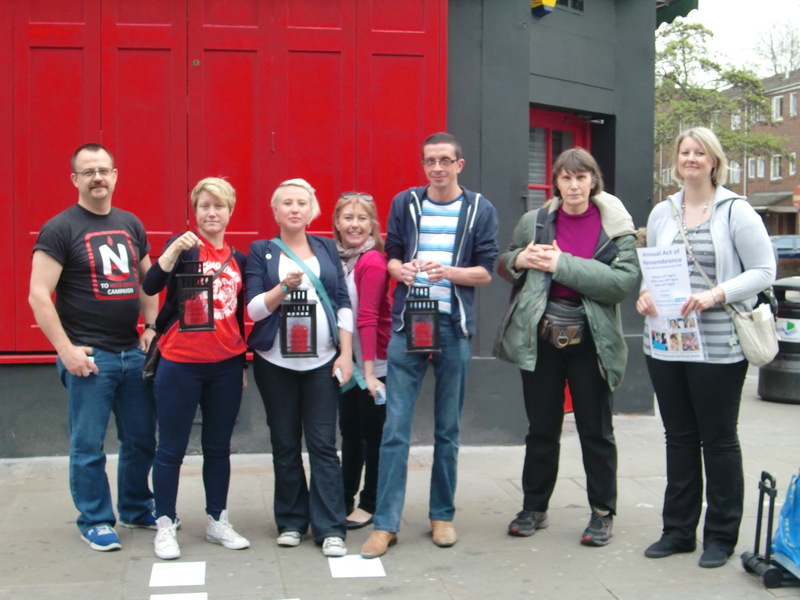 Five volunteers handed out over 400 London Hate Crime Reporting Cards and chatted to some of the locals including a man who said he lived nearby. 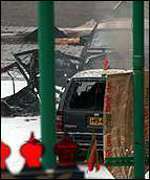 It transpired that he was about nine years old when the bomb went off and he heard it as he was taking a shower. Several of the restaurant owners came out and said hello. Some recounting their experiences of when the bomb exploded including one man who had parked his car next to the car that was carrying the bomb. He said he never drives his car to Brick Lane any more. 6pm meet at the Sweet and Spicy restaurant, Brick Lane. 7pm ends – we will go for a meal at the Sweet and Spicy restaurant. We have invited members of Rainbow Hamlets to join us this year. As planned we met outside the Spice of Life restaurant at 6pm, lit three candles and spent an hour talking to people passing by. After holding the moments silence we went for a meal in the Spice of Life restaurant – which is becoming an annual tradition. 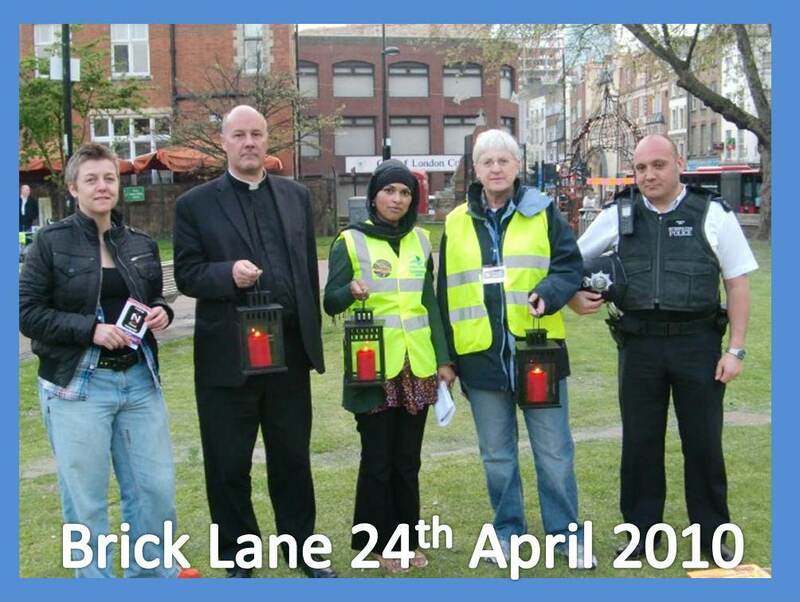 Sunday 24th April to mark the 12th anniversary of the London Nail Bomb attacks on Brixton, Brick Lane and Soho. 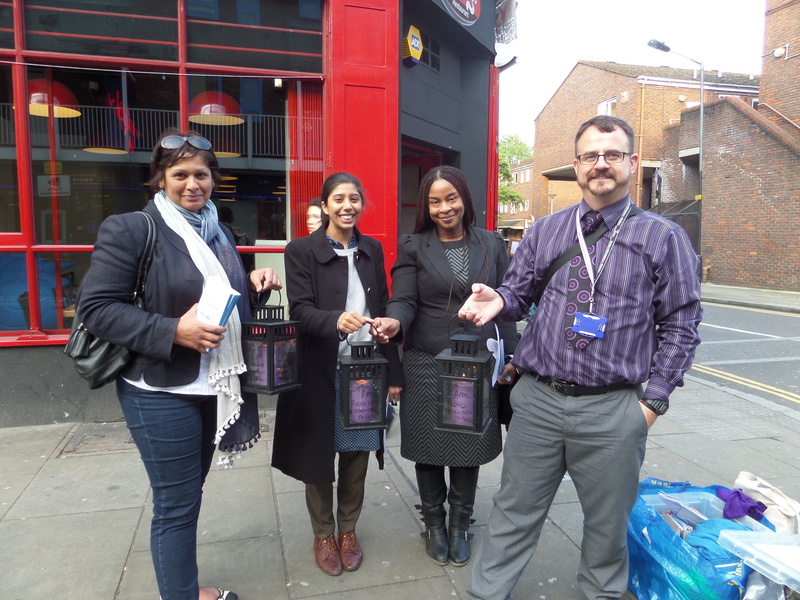 The act of remembrance started with a small gathering of people by the Red Post box, opposite Brick Lane Police station. This was close to the site where the bomb had exploded twelve years ago injuring 13 people in the area, mostly diners in the Sweet & Spicy restaurant located nearby. 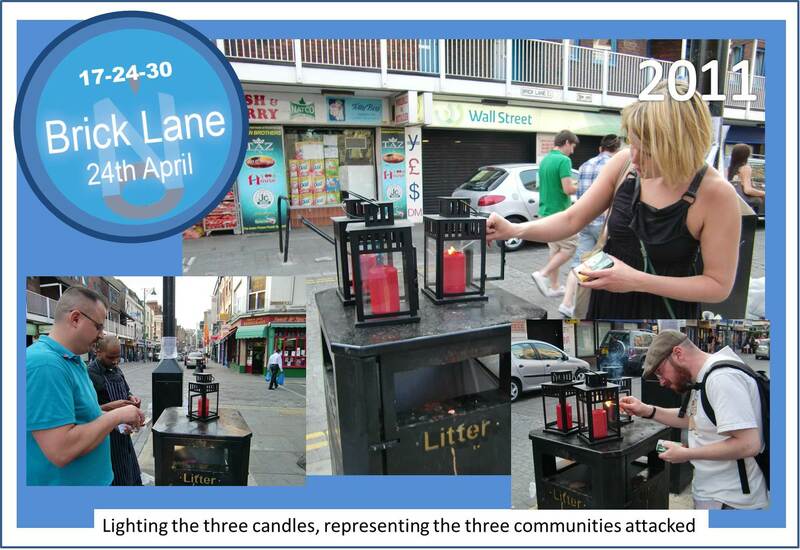 Mark, Sarah and Glyn took turns to light the three candles, symbolising the three communities that were attacked. Then some cards with contact details for the 17-24-30 No to Hate Crime Campaign were given out to bystanders before the group walked down to Altab Ali Park to hold a small vigil. At 6.15pm there was a minute’s silence followed by a few words by Mark the organiser of the event.